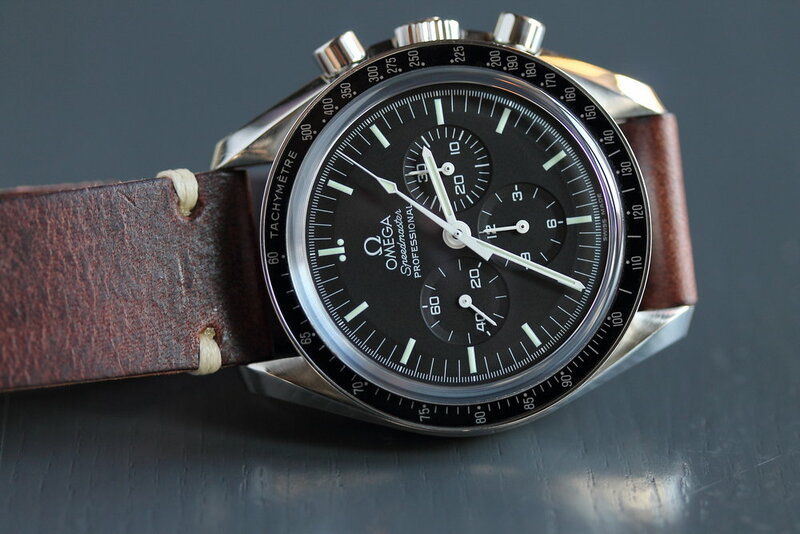 This past Sunday I heard the unabridged-version of a delightful story about a special Omega Speedmaster worn by Chase Fancher. Besides running his new-on-the-scene watch company Oak and Oscar – and being a Dad to a one-year old – he's one of the founders of the #CommonwealthCrew: The Chicago chapter of New York City’s eminent #RedBarCrew – the original – and still going strong – group of watch lovers who meet regularly to share their favorite timepieces and discuss ‘all things horology.’ If you love watches and live in the Midwest – or perhaps are just passing through on business or for pleasure – you should follow him on Instagram @oakandoscar to get on his mailing list and see his latest adventures in watch collecting. When Chase’s wife burst-out with the news that they were expecting their first child, a lot of thoughts and emotions were swirling around in his head. Among the natural reactions of a parent-to-be – Are we having a boy or a girl? When can we tell our family? – the topic of a ‘push-present’ hung in the air. Even though this recently-popularized custom is generally reserved for women – as a gesture of appreciation for actually being the one giving birth – Chase wanted one too. After all, doesn't he get something for the pain and suffering of having to change diapers? Chase asked for a watch to honor the birth of their child. Going back to when he received his grandfather’s antique Hamilton, the idea of carrying-on a family tradition meant a lot to him. His “amazing” wife knew full-well how much he loved watches and was instantly on-board with getting him one as a gift, but under one condition: The watch wouldn’t really belong to Chase. Rather, he could only wear it until giving it to their son one day. With the ‘green light’ to go watch shopping, Chase was particularly conscientious about selecting the right one: He was in search of a watch that would be more than simply something passed-down at an appropriate time. Chase needed a watch that best-exemplified the qualities of watchmaking that he found irresistible in hopes that his son would develop the same level of appreciation and passion after learning about it. In addition, Chase was deliberate in choosing a watch that could also be an object to stimulate his son’s mind beyond the realm of watch collecting – perhaps even serve as a vehicle to instill some life lessons. 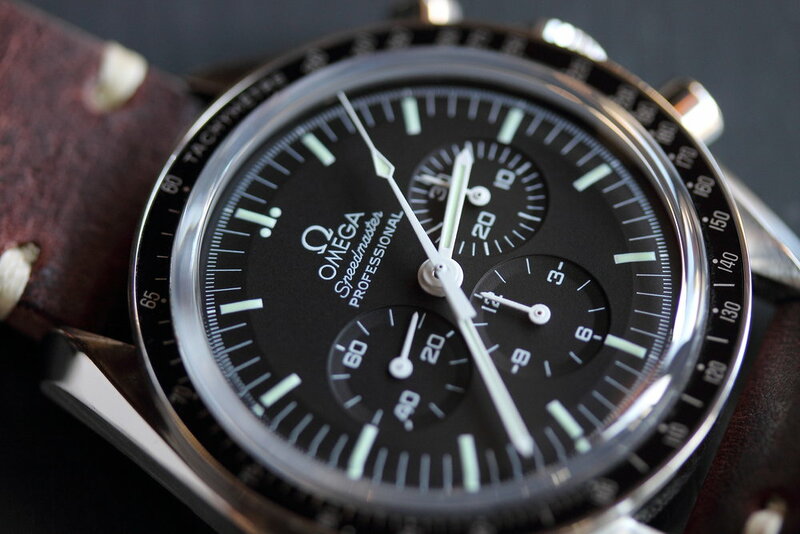 Chase determined that the proper tool for the job was the classic Omega Speedmaster. He debated between a vintage or modern model; one with a solid, engraved caseback or one with a transparent caseback. After weighing all the opinions he solicited and received from the watch community, he decided to source a ref. 3573.50.00, affectionately known as the ‘Sapphire Sandwich’ version because sapphire crystal – versus traditional hesalite – is installed on the front as well as the back. 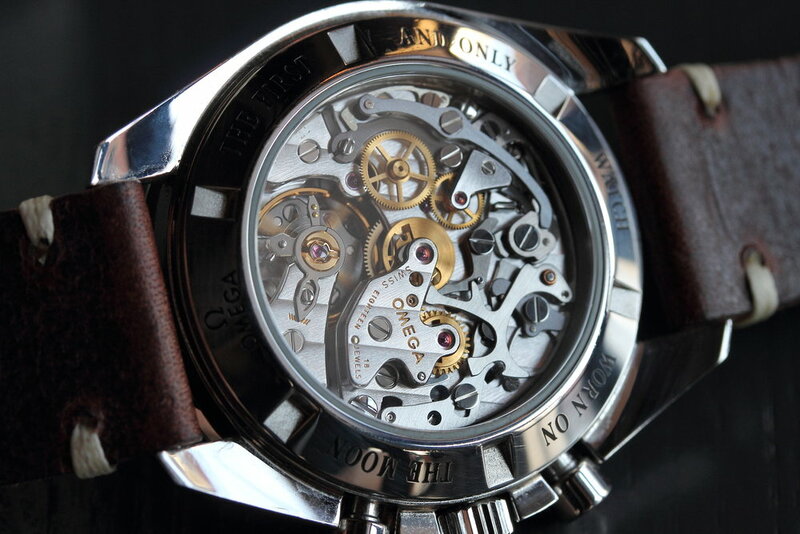 This modification fully-displays the beautiful caliber 1863 movement. Chase couldn’t resist imagining the day when his son’s eyes would widen and his young mind be 'blown away' trying to comprehend how all those tiny parts work harmoniously to power the watch. 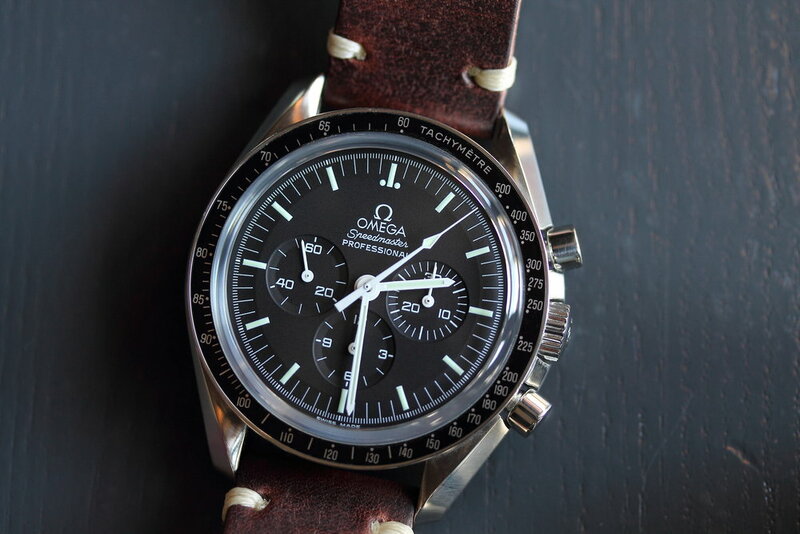 It took time to procure this specific Speedmaster because Chase opted not to purchase the watch brand-new; he preferred buying it second-hand. He was looking for one in just the right condition and for just the right price. He and his wife wanted to acquire their son’s Speedy in this manner because – when telling him about it years from now – they felt it would be a good example of not only what you can get if you “work hard”, but also how you can “save a little money” if you do your ‘homework’ on an item and have some trust in people. Their son’s Speedmaster arrived a few months after he was born. But a watch was still present during his birth: Chase had his grandfather’s vintage Hamilton tucked-away in his pocket in the delivery room. For Chase, it was important for his son's connection with watches to start early. The particular features of this Speedmaster model offer a lot in terms of bonding opportunities for Chase and his son. When his son has the attention span to begin learning about watches, Chase can’t wait to flip the watch over and see his son's reaction to the intricate manual movement nestled inside. Going with a see-through caseback will surely increase the odds his son becomes fascinated with watches. Marveling at the gears and being taught how they work together could be how Chase’s passion transfers to his son. Beyond the technical aspects of this watch, it has several practical and aesthetic qualities that Chase can use while raising his son. For example, he prefers to outfit his son’s Speedy with NATO and leather straps. From using the distinct straps to quiz him on his colors, to showing him how to fasten and unfasten a buckle, it may well prove to be a fun educational tool. Not to mention Chase will use this watch to teach his son how to tell time. When his son, unknowingly, places his cute, chubby – sometimes sticky and messy – hands and fingers on his Speedmaster, Chase can’t help but think about the day when their quality time includes talking about and fiddling with watches. Right up there with ‘the birds and the bees’ chat, Chase anticipates explaining to his son how a chronograph works. When he does this, he’ll tell his son that – when he was really little - he used it to time how long it would take him to fall asleep. Chase doesn’t know what will ‘stand out’ about this watch to make 'watches' resonate with this son. Will it be the “pretty” movement that intrigues him? Will it be the colorful or exotic straps that leave an impression? Or will it be the well-known, historic connection to space-travel that does it? Chase believes the ‘Moonwatch’ appeal will probably be what keeps his son engaged. After all, Chase has a cool story to go with that topic: The dealer he bought the watch from was wearing it when he met Buzz Aldrin at an event celebrating the 45th Anniversary of the USS Hornet – the Apollo 11 and 12 recovery ship. My honest reaction to Chase's Omega Speedmaster really belonging to his son was: “Why didn’t I think of that?” Chase will admit he’s probably not the first father to buy a watch with the intention of giving it to his son. With interest in watch collecting growing exponentially by the day, there’s no doubt more fathers will want to impart their passion the way Chase is going about it. If his idea lands you a nice watch – albeit one you’ll have to relinquish down the road – you can thank Chase later for sharing his story. Chase is extremely proud that “one day [his] son will wear [this].” His plan is to present this Speedmaster to his son to mark a big-moment in his life (i.e. having a child of his own or getting married). These milestones are a long way off. For now, Chase will enjoy wearing it as he witnesses his son's smaller – but equally significant triumphs – such as his first words and first steps.